For years, Los Angeles' food scene has been a strange balance of guilty-pleasure eating followed by uber-dieting. L.A. is the city of In-N-Out Burger, Disneyland churros, and heavy Mexican food. And for each time you eat one of those caloric dishes, you need six salads to make up for it. But in recent years, the L.A. dining scene has begun to change—and it’s doing so along the lines of the Culinary Shifts that we are seeing across the country. Drive through Hollywood or Studio City, and you see more small plates restaurants (think Luxury Re-valued), appetizers with Spain’s Manchego cheese (Cultural Curiosity), and more old-school, rustic dishes, like roasted bone marrow (remember, Simple Refuge and More with Less). Since the dawn of the iPhone App Store, there have been foodie apps. Recipes, diets, restaurants, you name it, if it relates to food there is probably an 'app for that.' Along with the apps, every foodie, techie, and foodie-techie has their own list of top 10 food related iPhone apps. Now Apple has take the matter into their own hands. Last week's App Store Spotlight highlighted exactly that. Check out Apple's list of top apps for people who love food. 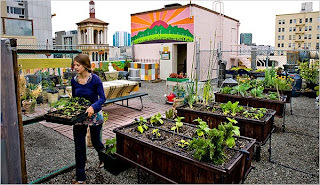 In recent years though as agricultural production has grown in densely populated areas throughout the country, urban agriculture has softened its rough edges--and in some cases, even come to represent cache and good taste. The latest issue of the New York Times Style magazine included an entire story on rooftop gardens. The roof of the city's luxurious Crosby Street Hotel hosts rows of heirloom tomatoes, lettuce and herbs--as well as a blueberry patch and coop for Araucana hens (which lay blue eggs). Roberta's, a Brooklyn pizzeria harvests chiles, herbs, tomatoes and beets from the 40,000-square foot rooftop farm it runs in conjunction with Brooklyn Grange, a commercial farm. And the super hip, Ace Hotel is setting plans for its garden too. As urban farming has expanded, so has the type of product coming out of these gardens. Where fresh produce one predominated, there are more chickens and rabbits. And raising these animals in confined spaces has become easy because of companies like Omelet, which makes urban chicken coops. Even Boulder has begun to catch this urban agricultural fever. For now, its efforts are personal or small scale. (Eric Skokan of Black Cat operates his own 10-acre farm and CSA. Big Red F restaurant group has a number of window boxes it uses to grow herbs.) But next year, downtown Boulder plans to launch an effort to develop rooftop gardens. We're crossing out finders that this becomes a reality. Just imagine what this might mean for local restaurant--or possibly even First Friday lunch. This summer, the ice cream truck will get a run for its money. Denver and Boulder have finally caught onto the nation's street-truck craze. In addition to Denver's Gastrocart, once warm weather hits, the cities will have cupcake, taco, and breakfast carts, too. Here's a quick rundown of what you should expect to see about town. Denver Cupcake Truck The sisters behind Park Hill’s Cake Crumbs bakery have launched this mobile sweet-tooth haven. Each day they, and their cupcake man, fill the truck with eight varieties of mini-cakes (the lemon’s delightful)—and plenty of milk. Then, they hit the road. Pinche Tacos This month, Kevin Morrison—co-founder of the Spicy Pickle and Culinary Council member—will open his homage to Mexican street food on Denver’s 16th Street Mall. Steuben’s Food Truck The beloved retro comfort food restaurant puts its menu favorites on wheels next month. Watch out for the vegetable oil- and solar-powdered, 1978 Chevy, which will make rounds during lunchtime. Comida In Boulder this spring, brake for the pink truck of Rayme Rossello, co-founder of Proto’s Pizzeria. From her small movable kitchen, Rossello plans to dish up a variety of gorditas, quesadillas, and breakfast eats. StreatChefs And finally, the street cart we’ve all been waiting for: Hosea Rosenberg and Michael Rice’s venture. Hosea’s blog suggests his restaurant-truck will be up and running next month—and word around the office, is that the internationally inspired foods are delicious.